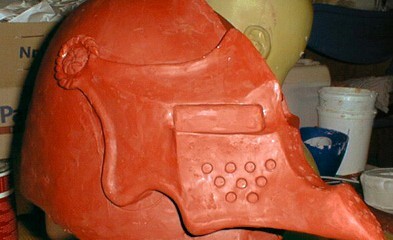 This helmet and gorget was made in clay first and then cast in latex reinforced with a thin layer of tough polyurethane foam. They were used for the ²Jabberwocky² film. I suppose I could´ve found real armour parts, but not ones looking they way I would´ve wanted them. Better to make them yourself, then ­even if they are fake.